Patrolman Dave Powell’s life is unremarkable, one of mediocrity and unfulfilled dreams. A fifteen year police veteran, he has little to show for it but a crappy, ranch-style house, an expansive gut and cholesterol levels through the roof. Yet, the one good thing in his life has always been his wife, Karin. Until, Dave Powell begins to suspect his wife of cheating. Then worry becomes paranoia, and paranoia becomes desperation and fear, all of which conspire to create a perfect storm with deadly consequences. Living a mediocre life and facing the possibility of a cheating spouse, what’s a fifteen-year police vet to do? Find out in this short story about a police officer on the edge and desperate to do something about it, with deadly consequences. 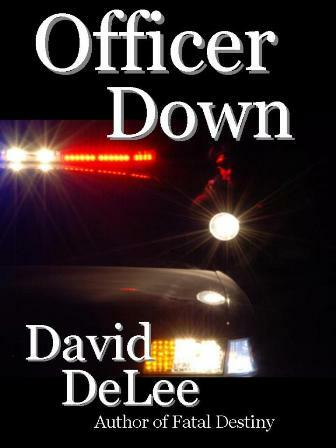 OFFICER DOWN is available from Amazon, Barnes and Noble, iTunes, SmashWords and the Sony eBookstore. David DeLee is a native New Yorker, though he and his family now make their home in the great state of New Hampshire. He holds a masters degree in Criminal Justice and is a former licensed private investigator. His previous short fiction has appeared in DAW’s Cosmic Cocktails anthology and consecutive volumes of Strange New Worlds, published by Pocket Books. His short story, Bling, Bling, featuring bounty hunter, Grace deHaviland, appears in the Mystery Writers of America anthology The Rich and the Dead, edited by Nelson DeMille and published by Grand Central Publishing in 2011.